The project I am currently working on requires a lot of hexadecimal numbers to be entered into the code. I once saw a pic of an old keyboard with a hexadecimal numpad (has A-F letters on it also) replacing the normal numpad. Anyone know where I can get one of these? 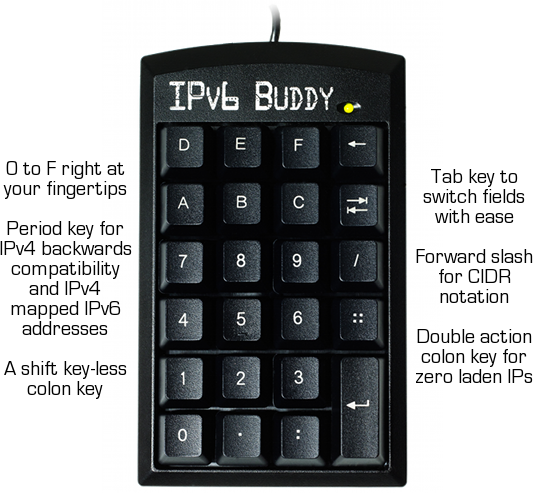 IPv6 Buddy -keypad should work well for hexadecimal input. If you can get your hands on one of the retired space shuttles, they have one! 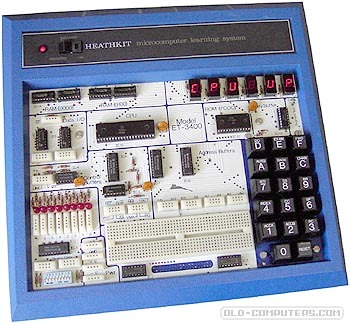 I have an old Heathkit learning toy with a hex numpad because the only way to program it was to assemble code by hand (it came with a 6800 manual and some notepads) into the online monitor. This was actually fun! Mine is missing the 'D' button however. Great idea with the programmable keypad. I think i am going to pick up one of these: DX1 input system. Works for any reconfiguring I might want to do. You have two hands. Use them. A-F are all reachable with the left hand on a standard keyboard while your right hand is on the num-pad. Instead of putting muscle-memory time into some arcane Hex-pad, you'll be learning to touch-type with your left hand, which has application outside your current project. Better yet, come up with a smarter way of getting the hex codes into your code. Write a script that extracts them from your data-source and into your code as symbolic variables... or whatever. Ok, I'll give you the benefit of the doubt. Lets assume you're working on a hardware project and need to provide a specialized interface for your user. Maybe a programmable keypad would fit the bill? Not the answer you're looking for? Browse other questions tagged input keyboard hex or ask your own question. Why are hexadecimal numbers prefixed with 0x? How do I write letter-initiated hexadecimal numbers in masm code?